Aisin Gioro Yuhuan (1929 – 2003) was a Chinese artist born in the Aisin Gioro clan, the imperial clan of the Qing dynasty. Aisin Gioro Yuhuan often painted in traditional Chinese painting styles, such as the use of calligraphy and highly detailed brushstrokes. For instance, Gongbi, meaning “tidy,” is a realist technique in Chinese painting that delineates the edges or borders of a figure very precisely. In this painting, it is clear where one figure begins and ends through the use of careful detail. Chinese art has been argued to have the oldest continuous tradition in the world, and therefore, artists who work within the tradition utilize these specific techniques and methods in their work. 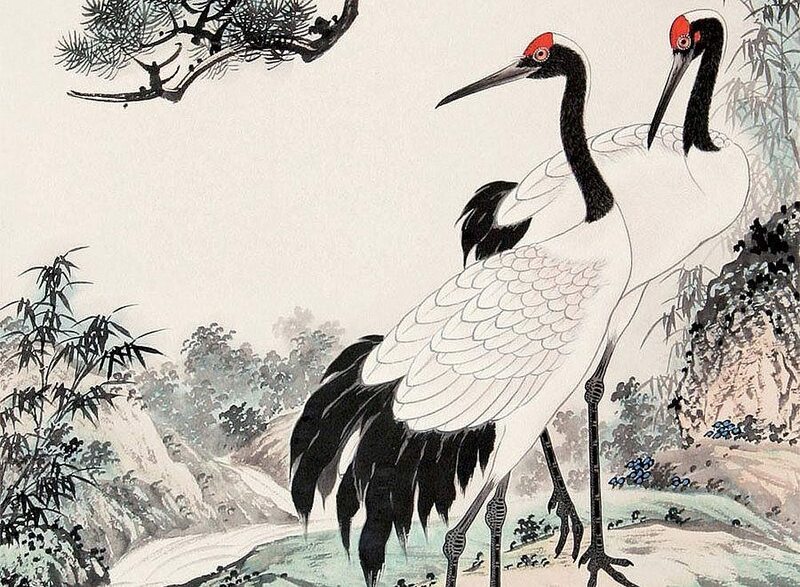 The prominent characters of the painting are the two red-crowned cranes standing by a stream and looking behind them. The Red-crowned cranes are some of the rarest cranes in the world, and are recognized as symbols of luck, longevity and even immortality. In Chinese art, those who are immortal are often depicted as riding on cranes. The red-crowned crane can also be a symbol of nobility, as depictions of this crane have been found on tombs of the Shang and Zhou Dynasties. The scene is calm, and the whiteness in the backdrop might be fog, symbolizing a difficult past. The colors of the bush in front of them – blue and red – evidence of a more fruitful future. The cranes look behind them to the past on the other side of the stream, to which they may not return. Perhaps they are looking toward the mortal world while their bodies face the world of immortality. The hope for immortality, while exciting and even desirable, can also be recognized as departing from the world of family and friends which turns the piece into a more melancholic one; the perspective is not only that the cranes are moving to an exciting new prospect, but that they are leaving something beloved behind. Is there anything more beautiful than a barn owl? I think the cranes may be looking back at the path they have travelled while resting and reflecting on the idea of moving to new and better things.